This picture shows how 08 817 brings Wansbeck Road into the 1980's. I recently sent Tim Shackleton an article based on the construction of the 08 kit. Although it's fair to say the instructions formed a large part of this article there was still quite a bit of work involved to make it suitable to the wider audience it will have when read in MRJ. Thanks to Chris Higgs for his considerable contribution not only for the design but also his write up which forms part of the article. This present picture is a re-take at Tims request (I'm only doing what the editor asked....!) because there was something about the other colour shot I sent him that wasn't to his liking. I think I know what it was and he's probably right to request another. 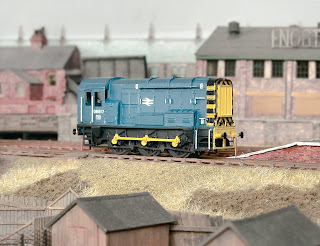 Another source of prototype pictures is http://www.martinbray-ukloco.com/class08.htm so paste it into your address bar and pick your locomotive.